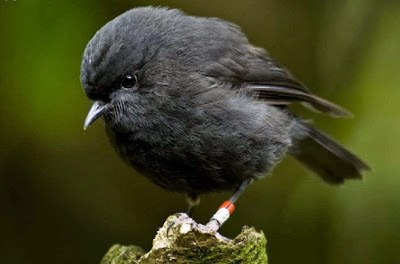 The image above comes from a fascinating article about the black robin, which is found only in the Chatham Islands, off the Eastern coast of New Zealand. Human occupation of the islands, among other things, put the birds in peril, and by 1980 there were only five birds living, and only one of those five birds was female. A book titled The Black Robin: Saving The World's Most Endangered Bird tells how the species was saved. The article from which the image was taken makes a point about how these successful recovery efforts, because of the way they were carried out, almost led the birds back to extinction. The book is 308 pages long. The article takes five minutes to read. If you are interested in this topic, I'd suggest starting with the article. If you do read the article, "In Saving A Species, You Might Accidentally Doom It," you will find that those working in the recovery efforts moved eggs that were laid on the rims of nests, which would certainly not hatch, and placed those eggs into the center of the birds' nests, where they had a much better chance of hatching, and by this technique ensured that more offspring would move to the next generation. 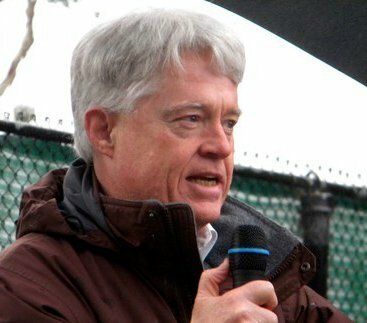 That all sounds great, but unfortunately, by interfering with the normal rules of natural selection, the recovery effort increased the predominance of a gene that led to the rim-laid egg tendency, and that meant that the recovery was actually establishing a genetic characteristic that would guarantee species failure in the long run. As I say, I found this a fascinating article. It seems to me that it is a cautionary tale, and that the story of the black robin should make us think again about our often presumptuous ideas that human beings can properly run the natural world. The emergence of a recessive trait is not evidence for folly by Don Merton and his team. They made the right call nudging those eggs into the center of the nest. The cautionary tale is about a bird allowed to become severely endangered in the first place, not the hubris of trying to save the species. We are part of nature, and have a responsibility to prevent extinction. This is no attempt to run the natural world, but an exercise in compassion and foresight. The article agrees with your point, and so do I. But there is a "cautionary tale" available in this story, for those who have ears to hear, and it is precisely that we should not be tempted to "run the natural world."